Nicola has been the Practice Manager at Dental Solutions for over ten years and has worked as a nurse with Gavin Laidlaw at Dental Solutions since 2001. She ensures that the highest standards of dental care and hygiene are maintained at the clinic and keeps the Dental team in order! A qualified dental nurse for over 20 years, she also qualified in 2011 with an NVQ level 3 in Dental Practice Management. Nicky has been at the forefront of obtaining CQC approved status and the British Dental Association Good Practice accreditation for 7 years running. 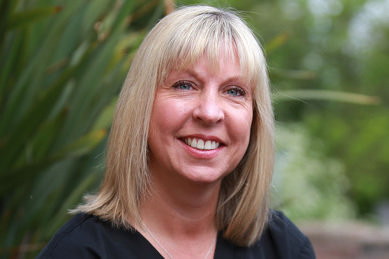 Not only a vastly experienced dental nurse, Nicky works closely with Gavin Laidlaw and Richard Brookshaw – her passion is Dental Implants. She has nursed and managed for Richard in the most complex of implant cases including Zygomatic implants and All on Four treatments. Nicky is here to look after your needs every step of the way, from organising your bespoke implant treatment plan to booking your staged appointments and arranging suitable payment options. She is here as a first point of contact to answer any questions or concerns you may have about your treatment or appointments and is contactable by phone or e mail if you need ever need any help or support. Nicky is married to husband Simon with two girls Holly and Maisy. She has lived in the village for many years and loves being part of Lymm’s thriving community. She’s also a keen Warrington Wolves rugby league fan and is a season ticket holder.